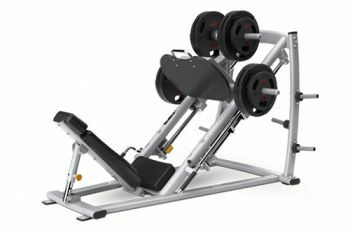 This leg press is easy to use weight training machine with a racking mechanism and adjustable bottom stops that provide long or short ranges of motion for all users. It also has an adjustable angle back pad to enhance conform, optimize hip angles and to accommodate a greater range of users. CitySport members can also benefit from an assistance handle on the platform for easier entry and exit. Its six integrated weight-storage horns hold multiple weight-plates sizes.